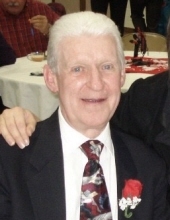 Charles Herbert “Herb” Breed 80, passed away Wednesday March 20, 2019 at his home in Hartford. He was born June 12, 1938 in Emporia, Kansas the only child of Charles Kenneth and Mable Maude Logsdon Breed. Herb attended Hartford High School where he graduated with the Class of 1956. Following high school Herb enlisted in the United States Navy. He received a honorable discharge from service after serving in the Great Lakes Region. Herb was joined in marriage to Carol Lavon Crouch on June 14, 1958 at the Hartford Methodist Church. That day would mark the beginning of over 60 years of devoted love for each other and a deep appreciation for each day spent with family and friends. Herb began working at Beech Aircraft in Wichita before taking a position with Panhandle Eastern in Kansas City. He was later transferred to Liberal, Kansas and Ft. Worth, Texas. In 1978 he moved to Casper, Wyoming and took a position with True Oil Company where he retired as the Manager of Computer Services in 2001. Following his retirement he and Carol would make their home in Hartford. Herb was a devoted husband, father and grandfather who loved to travel and experience new surroundings. He will live on in the hearts of his wife Carol of their home in Hartford; a son Gregory William Breed and his wife Ardell of Casper, Wyoming; three grandchildren, Stephanie Wells and her husband Tim, Charles Gabriel Breed and his wife Kim and Zach Breed and his wife Jackie; great-grandchildren, Tye Wells, Charles Gavin Breed, Cassidy Breed and Alta Breed. Herb was preceded in death by a son, Charles Jeffrey Breed in 2005. A memorial service will be held at 11:00 A.M., Monday, March 25, 2019 at the Hartford United Methodist Church. Herb will rest in peace in Hartford Cemetery. Memorial contributions may be made to the United Methodist Women of the Hartford United Methodist Church and sent in care of the Jones VanArsdale Funeral Home in Lebo. Condolences may be expressed at vanarsdalefs.com. To send flowers or a remembrance gift to the family of Charles Herbert "Herb" Breed, please visit our Tribute Store. "Email Address" would like to share the life celebration of Charles Herbert "Herb" Breed. Click on the "link" to go to share a favorite memory or leave a condolence message for the family.